What you are looking at is a Tagcloud from a site called TagCrowd. that maps out the conversation -- even buzzwords -- I use on my blog. Seemed fitting to helicopter up to see the big picture before embarking upon yet another year of blogging. Credit to a post I read on Jeff Jarvis's blog for prompting me to trial-run this tool. Spam on Facebook? Say it Ain't So! 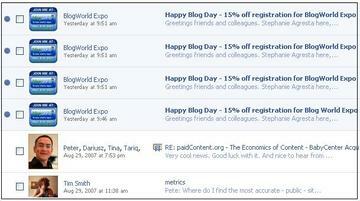 I just checked my Facebook email box and noticed that I had four identical emails from "Blog World Expo" that looked and felt quite promotional in nature. Turns out it was a rather innocent mistake, but it still freaked me out a bit. Part of what's drawn me to Facebook (as with so many others, I presume) is my newfound power to control, filter, and "permission" content. And by doing so, my ESR (email satisfaction rate...a term I've just invented...see the rare blank on Google) has gone up dramatically. Now I fear I'm about to enter than all-too-familiar "post-innocence" phase where my over-zealousness (ego-driven?) in approving friends, joining groups, or checking off this-or-that cool widget is about to backfire. Ripples of Irony: There's some irony here. Only a few weeks ago I wrote an article entitled the Two Faces of Facebook in which I quoted Robert Scoble saying, with both pride and uber-enthusiasm, that "Facebook has decided to protect me from spam." Technically he's right, as "we" control the levers, but I suppose we may need to scour, sanitize, and double-check our lists here and there, especially our friends lists...and the friends of our purported friends. 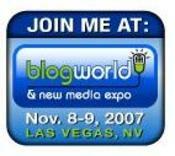 (Recall my first rumination Meaningful Relationships with Social Networks) The second irony here (and again, all innocent...so don't shoot this messenger) is the email blast triggering this blog came from the "Blog World Expo" (which sounds like an awesome event, I must say). I almost wish it came from Sanford Wallace or Herbal Remedies, Inc. It's harder to get huffy and puffy when the source of your painpoint is the very folks who have led and nurtured this exciting new "join the conversation" culture. Then again, maybe this is a needed irony. Happy Labor Day to all! YouTube just announced it would start sharing revenue with key "content" partners. This is generally a positive direction but it raises a host of new, somewhat challenging questions. Less clear is whether all content providers would share in the revenue, as currently takes place with video sharing site Revver.com. "Now some of your favorite YouTube members--including LisaNova, renetto, HappySlip, smosh, and valsartdiary--will begin to participate in the same revenue-sharing and promotional opportunities that are available to YouTube's other partners," YouTube said on its blog. The word I'm fixating on is "some." But whole hog or half-way, moving to a revenue sharing model is a very big deal, and it has a number of very important implications, including around transparency and disclosure (see my earlier 11/6 ClickZ Column, YouTube or Confuse Tube?). I outlined a few of these implications last January when the first news leaked that YouTube leaked might be considering a revenue share model. It's worth another skim! "The Pocket Guide to Consumer-Generated Media"
"Attention? I Don't Want Your Freakin' Attention!" "TV is Dead, Long Live TV"
"The Pocket Guide to Chatterbacking"
"The Third Moment of Truth"
"Real-Beauty, Real Breakthrough in Consumer-Fortified Media"
"Movimiento Marketing: On the Radio Dial"
"Time for a New Marketing Model: Listening-Centered Marketing"
As I note in my opening, I have sought to keep my commentary focused on a few key themes I believe are mission-critical for today's CMOs. Themes like marketing in an era of consumer control and consumer-generated media; managing media fragmentation and new marketing models; and, most important, leveraging and exploiting the untapped power of listening. I've tried to be self-critical, wary of hype, and mindful of the danger of bagging the truth against a backdrop of dynamic change. If there's one area in which I've been unapologetically righteous, it's been in my message that if we further erode trust or credibility in consumers' eyes, we're toast -- end of story. My ClickZ article today takes a critical (if not introspective) look at the excesses of advertising. Importantly, I ask the question. From shills to cheap thrills, we're just degrading the space and killing our cred factor. We're confirming to the world that we're taking, not creating, value. And as we saw in the flogging mess, our right hand often has no idea what the left one is doing. Tomorrow is the Super Bowl, the biggest ad bonanza of the year, and the shadow of the Boston marketing "hoax" still persists across the web. Big marketers have every reason to hope (and pray) the issue goes away, or at least takes a temporary siesta. After all, who wants divided attention on some other "marketing" issue when you can have full attention. 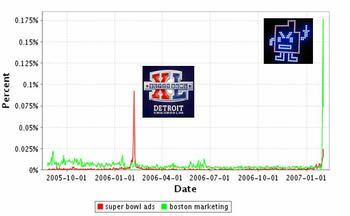 What's clear from analyzing the buzz patterns is that while the Boston issue has reached its peak, it is still driving more conversation than the pre-buzz around the Super Bowl ads. Even on the major video sharing sites, the Boston issue is far more dominant than anything related to the Super Bowl ads. On BlogPulse's video rankings, the Boston issue takes two of the top five video slots, including the #1 position. As of midnight this evening, it also ranks #1 on Technorati. Quite a few variables are keeping the story alive, from debates over whether the campaign's a success (measured by awareness & reach) to the unrepentent antics of the two guys who ran around Boston putting up the devices. Oh, and then there are all those "new" videos on YouTube offering commentary on the issue. Even the topic of "hair" is driving some of the conversation. While there's no question the issue will fade to the background during the Super Bowl, marketers need to think hard about the event's "latency" effect. Tens of thousands of comments have been posted online about the Boston hoax, most in the context of "marketing" and "advertising." This guarantees that it the issue will live in perpetuity via search results. This is a part one in a series on reflections and analysis on YouTube's potential entry into revenue sharing with content creators. In terms of paying users revenue against the content that they’re uploading, we’re definitely going to move in that direction. We didn’t want to build a system that was motivated by monetary reward. We wanted to really build a true community around video. When you start out with giving money to people from day one, the people you do attract will just switch to the next provider who’s paying more. We’re at a scale now that we feel we can do that and still have a true community around video. Scott Karp of Publishing 2.0, who's written a fair amount on this topic, offers this shippet of interpretation on Hurley's comment: “We made all those poor slobs work for free, and now that we’ve sold them out for $1.65 billion, we’re finally ready to share a few crumbs.” Yes, perhaps, but the more interesting question, I think, is how all this plays out over time. Like it or not, YouTube is more than just an isolated video playground; it's now a de facto standard tied to the fastest growing ad seller in the marketplace (Google). And with that question in mind, I offer here ten potential scenarios, predictions, and implications of YouTube shifting to revenue-sharing. 1. News Spread Faster, and Gets Edgier: As with blogs, YouTube traffic flows operate on an aggressive “first to post, first to reap” principle. Think about Jeff Jarvis, Robert Scoble, Steve Rubel, and even TVnewser. These blogs are consistently first-to-market on new news, and over time this helped each one build an influential tartgeted audience. Translated to video, expect those who post first to reap disproportionate financial reward, and this may end up putting the "first to post" concept on steroids. And then there's the "never before seen" phenomenon. With cash prizes on the line, expect consumers to cast an even wider and more aggressive net of camera phones and other surveillance devices to capture the weird, twisted, funky, and incriminating. Just think about that priceless scene in the UCLA "Taser" video -- whereby a bunch of students had their camera and video phones as high as they could reach recording the incident -- and multiply that by ten. 2. Growth of a New eBay-Style Cottage Industry: eBay has spawned a massive cottage industry of buyers and sellers who make their living exclusively on site transactions. Expect to see a similar model emerge on YouTube when revenue-sharing falls into place. The welcome news is that great content creators, including many struggling artists, will receive compensation they have earned and deserve. The big watchout here is that, as with eBay, we may see a huge amount of "gaming" the system. Will may even see a new art of commerce-centered “smart-mobbing” YouTube videos to help the find a tipping point of appeal. Will YouTube need to dial up "credibility" credentializing similar to eBays aggressive use of "trust" metrics? 4. More Dedicated Surveillance of Brands: Brands potentially face huge challenges in a compensated CGM environment. Recall, some of the most celebrated and popular (hence financially lucrative down the line) YouTube videos of the past year have involved brands being "exposed" or "outed" for poor service, call support, employee behavior and more. Hey, if that's the secret sauce, no call center agent is now safe from calls being recorded by consumer Steven Spielberg's..."for quality purposes" and maybe that is just an inevitable consequence of the new rules of "transparency." But when every content contributor is now a de facto paid reporter, every brand vulnerability or achilles heel will be under an even intense microscope. All the more reason for brands to obsess less with "paid" media and more over brand credibility and customer service. 5. Complications With "Co-Creation" or "Create Your Own Ad" Models: Think Super Bowl! Now compound that challenge with the big wave of "co-creation" under way, most visibly in next week's Super Bowl whereby three of the ads will be the product of user contributions. Looking ahead to the new YouTube model, if a Super Bowl contest-winner's ad find second life on YouTube, who gets the compensation? The original content creator? The brand? The agency? All of the above? Trust me, this will get really complicated, and even if brands us "fine print" to exempt themselves from compensating consumers, original creators will find a way to raise a stink...or create a viral protest. 6. Higher Bar for Brands Rewarding Consumer Contributions, Ideas, or Feedback: With YouTube setting the tempo, brands may be forced to now develop their own compensation models in instances where they solicit or accept consumer feedback that involves fresh or new thinking. Again, with YouTube nudging the habit change, consumers may come to expect "value for value" reciprocity in other places. 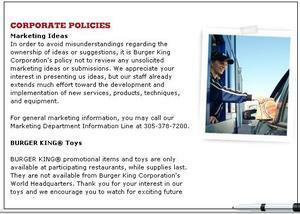 Remember, just about every major fast-food marketer has huge disclaimers on their web forms noting that ideas or suggestions can't be accepted, or that all rights are forfeited through the submission process. We even see this for major brands that are waxing poetic at the CMO level about the power and glory of "conversations." 8. Greater Need for Disclosure: As sites like YouTube become more “professionalized” by talented creatives or others looking to monetize their creativity, the line will get even blurrier to consumers in the context of what’s “genuine” and “authentic” versus others. Is the video "professional" or "amateur" or "organic"...or can we even make such distinctions? Moreover, is the total number of "views" the product of organic discovery or paid media. As I've noted before (see my ClickZ column, YouTube or ConfuseTube? ), YouTube is a bit fuzzy about disclosing whether featured videos are in fact advertising and promotional vehicles for paid sponsors. Moving to a compensation model may dial the viewer confusion factor? Trust marks and labeling might be part of the solution. 9. Re-engineering the School "Back Sale" -- Charity and Fundraising: On the more benign and innocous side, expect to a see a not-so-insignificant percentage of YouTubers elect to donate their shared revenue to charity or some other good cause. For many, this will be the true mark of “I’m not doing it for the money” authenticity. YouTube will likely perfect a payment mechanism that gives the shared revenue recipient a range of choices on how to spend the money. In some cases, YouTube might even “match” the donation to drive goodwill with both its users and advertisers. Alos expect to see a new genre of fundraising emerge based on a compensated video model. Schools, trying to raise money for the band or the school musical, will post content to YouTube and encourage everyone under the sun to watch the content. Hey, why not…if every view helps get the band to the Rose Parade, this can only be big! 10. Rich Rewards for Many, Soul Searching for Many Others: I'm far from the "big leagues" of high-traffic content creation, but I do consider myself similar to millions of other YouTube users. More specifically, I'm not creating content for the money, and I've even shied away from sites like Revver because I don't want my motivations for "self-expression" and "sharing" to be questioned. "Trust me," if sometimes go out of my way to tell others, "I'm not putting these videos up for the money." Yes, I suppose I rationalize directing revenue from the wee small traffic to the videos of my precious twins to a college fund, but darn that sounds weird…and even a bit cheap and tacky. Or does it? What I do know for sure is that for the coming months the blogosphere will light up with high-minded debates over whether new revenue driven model still preserves the integrity of the community, conversation, and participation. I honestly have no clue how it will all net out, but I'm looking forward to this discussion. This just in from Kate Kaye, a fellow ClickZ writer and author of the highly provocative (and dissonance-generating) Sales Pitch Society II: a thoughtful article/survey of the emerging (time for a new name) "Pay to Say" marketing industry (Paid Blogging Hits a Nerve, Spurs Competition). It's a highly troubling development (see earlier post when PayPerPost entered the scene), and raises very tough questions about the integrity of marketing. Importantly, marketers at some point need to make a choice about the type of environment we want to shape. Just about every CMO today is waxing poetic about the power and importance of "authentic" and "original" voices emanating from "empowered" consumer, and the VC community is reinforcing this loud chorus in their positioning around "Web 2.0" and "social media." Is this what we really want? Maybe not? Again, it's all about choices. Data is certainly not the issue here: to be sure, there's ampler research and analysis reinforcing the backlash factor of consumers feeling duped or betrayed if ostensibly trustworthy recommendation are in fact the product of "outside" forced; and even in an environment of "qualified" comments or recos, magic astericks, and other forms of real or sly disclosure, we're creating a mess of a confusing environment for consumers. Again, it's all about choices. What environment do we want? Again, here's Kate's article. Read it a couple times.